Recently I got a heads-up from a Swedish Paleo group on Facebook about a new product from Swedish company “Kungsörnen“. It turns out they’ve started making a bread mix which they call “Stenåldersbröd” – Stone Age Bread. Well, with a name like that, I had to give it a whirl, didn’t I? This entry was posted in Food Diary, Product review and tagged bread, Kungsörnen, paleo, product review, stenåldersbröd, stone age on April 2, 2015 by paleovirtus. I am not connected with Westmark, or anyone who sells Spiromats, in any way, shape, or form. I have received diddly-squat for producing this review. Having said that, and to paraphrase the late, great Douglas Adams, I am not above sponsorship deals in precisely the same way that the sea is not above the sky. If you are a manufacturer or a retailer even vaguely interested in sponsoring this blog, get in touch. 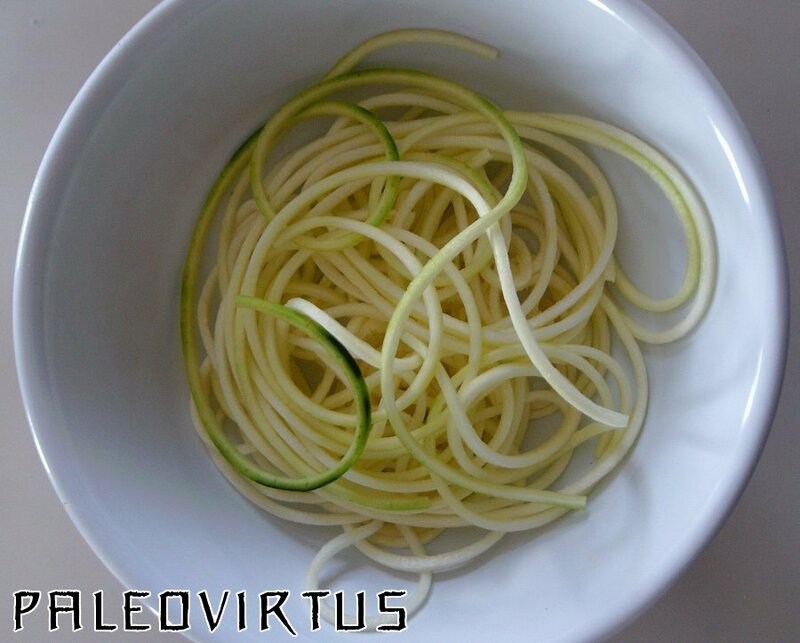 A while ago I produced a How-To post detailing the process of producing “pasta” made from zucchini / courgettes / squash ( you can find that article here ) without the use of a spiral cutter. However, last weekend I was in a cookware shop, and they just happened to have a Westmark Spiromat spiral cutter in stock. Having trained in the dark arts of vehicle body engineering, I like to think I know a thing or two about manufacturing standards, and the Spiromat seemed to be well made. I had also just received a bit of a windfall, so I was easily able to afford it. I think the photographs are self explanatory. 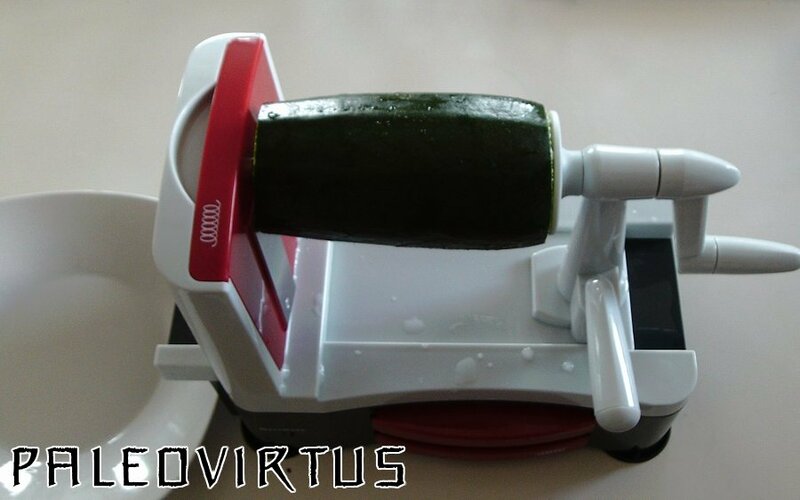 You clamp your vegetable of choice onto the unit at one end, on the spiked face of the hand-crank unit, and the other end at the tubular “pivot” on the blade unit. To produce your spirals, you then simply turn the crank, and at the same time feed the vegetable into the blade by siding the crank unit towards the blade unit. Honestly, it’s far harder to describe the process than to actually do it. I hesitate to use the phrase “idiot proof”, because I’ve worked in public transport, but this gizmo is about as close as you are ever going to see to being precisely that. I’ll put it this way – no manual is included, because quite frankly one isn’t needed. The product comes with 3 choices of blade, which cleverly slide into the body of the cutter when not in use. The blade that’s going to clearly see most action in this household is the one that produces a cut very similar to spaghetti. Another blade produces strips slightly wider than that, but not quite as wide as tagliatelle. The last blade produces strips that are as wide as the vegetable itself, if you follow, a straight-forward spiral cut rather than ribbons, in other words. Although to be fair it’s still early days with this device, I have to say that on the basis of its performance so far it gets a hearty Paleovirtus thumbs up. If you’re in the market for a well produced, well thought out spiral cutter, you most certainly could do a lot worse. The Westmark Spiromat on Amazon. A brief but helpful video showing the Westmark Spiromat in action. In Dutch. 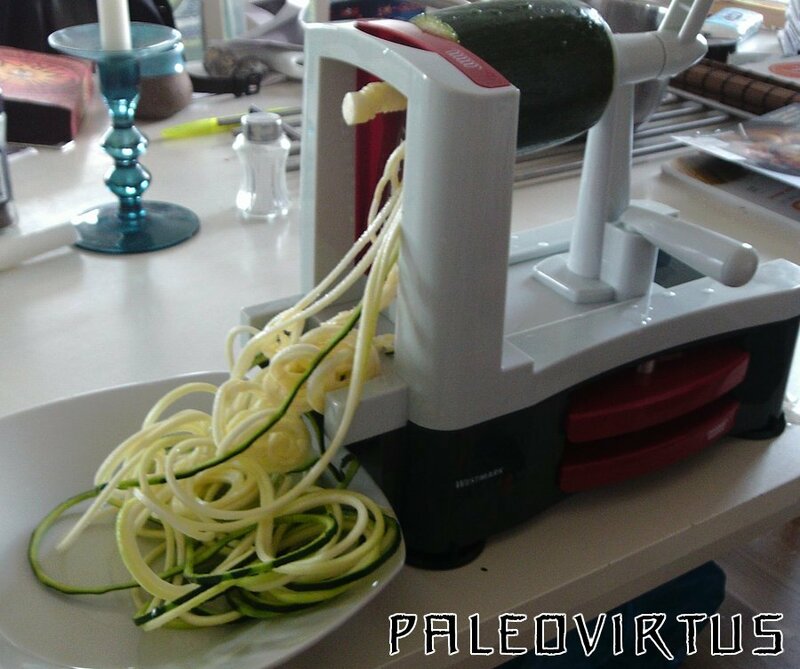 This entry was posted in Product review and tagged paleo, spiral cutter, Westmark Spiromat on September 24, 2014 by paleovirtus.